Window sheers are thinner than curtains and provide a way to filter out bright light from a window while still providing some illumination. In addition, they provide privacy without requiring that you totally block out a window. Over time, window sheers accumulate dust and household stains and often develop a yellow or dingy gray appearance. A good washing with gentle cleaning agents restores the sheers to a bright white color that enhances a window's appearance. Window sheers grow dingy over time. Remove the sheers from the window and slide the curtain rod out of them. Be gentle as you remove them because sheers are far more delicate than curtains and other thicker fabrics. Set a washing machine to the gentle or delicate cycle and fill it with warm water. Add a laundry detergent formulated for delicates, using the amount indicated on the bottle. Place the sheers into the washer and allow it to run through the entire cycle. Fill a large sink or a tub half full of cool water and add 1 cup of epsom salt to it. Stir the water up with your hand until the salt crystals dissolve. Remove the wet sheers from the washing machine and place them into the salty water. Press the sheers down until they are completely submerged. Allow the sheers to soak in the water for three to five minutes and then drain the water. Move the sheers to an outdoor location to drip dry making sure not to wring them out because it can stretch the material. To dry them indoors, hang them over a shower curtain rod so any drips are caught in the tub. 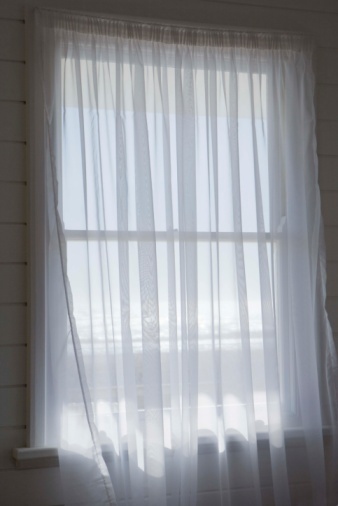 Rehang the sheers on the window once they are completely dry to the touch.